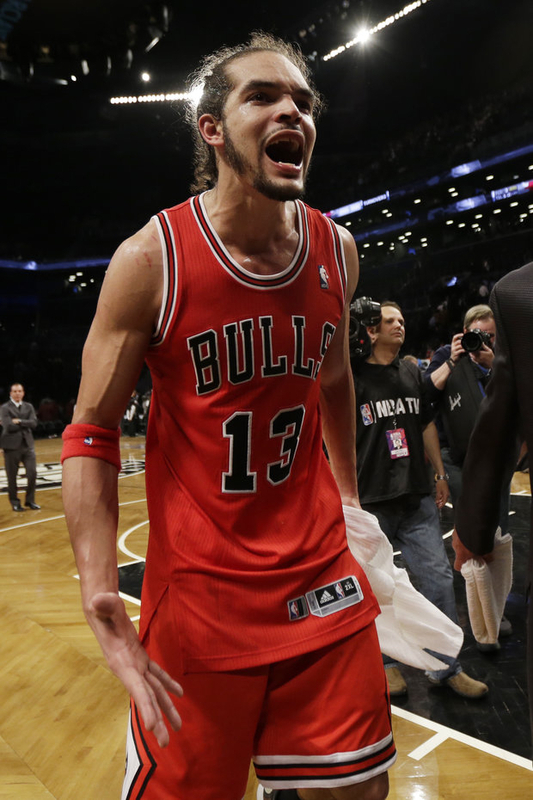 Joakim Noah and the Bulls will face the Heat. The sweet smell of the Bulls playoff series win in Brooklyn still lingers today, however, it will dissipate soon enough. Tonight the Bulls are in Miami to play game one of a best of seven series in round against the Heat. Fresh off winning his fourth NBA Most Valuable Player award, LeBron James and his teammates are also fresh since they have rested for several days. That is what happens when you dispose of the Milwaukee Bucks in a four game series sweep. You could not use the word fresh for the Bulls, instead, ragged, undermanned or tired. On Saturday, they completed a seven game series with a win in Brooklyn, while missing two important starters (three, if you count Derrick Rose). With Luol Deng experiencing problems with his spinal tap for his viral infection and Kirk Hinrich still hobbled by a calf bruise it seemed like it was the end of the road for the 2012-2013 season. What most Bulls fans have known and now is apparent to the rest of the NBA fans everywhere: this is a resilient team with heart and character. Joakim Noah would not let his team exit in the first round, which they did last year with him and Rose injured. Marco Bellini is back on track and filled in for Deng very well against Brooklyn. Coach Tom Thibodeau has proven time and time again he will get the most of what this team can give and they believe in him and the system. Throw another player’s injury or ailment at him and Thibodeau responds, “We have enough.” Against a more talented and healthy Nets team, it was enough. Against the Heat, I&apos;m sad to say the Bulls likely do not have enough. This Eastern Conference semi-final series will be a colossal challenge for the Bulls. Deng’s status is up in the air, he was weakened from his illness and if Hinrich tries to get back on the court, his movement will be limited. So no matter how you look at it, this is still a depleted Bulls club. But the biggest factor is they face the defending NBA champions. James is playing at a super-high level. He has tasted the champagne after earning his first ring and he wants his thirst quenched again. His teammate Dwayne Wade is expected to be back in this series after being hampered by a knee bruise in the Heat’s opening round. If the Bulls have any chance in this series, they must play a tough, physical game. Noah and Boozer must control the interior on defense and offense. The Bulls are prone to turnovers, especially without Hinrich. Nate Robinson has to think as a point guard and not act like a scoring machine. He will need to score, but he must keep the ball moving and make Miami play defense. It would seem without Deng that Jimmy Butler gets the short straw and will have to defend James. Bench play will be an important factor with all the maladies affecting the Bulls. Forget about the regular season series that was a split with each team taking two games. One of those Bulls wins did stop the Heat’s 27 game win streak. And of course there is loud chatter about Derrick Rose and his situation. Fans and media are beating him up about not suiting up for the games. Everyone is an expert on Rose’s reasons, but only he knows what he intends to do. It would be terrific if the former MVP was part of this series, but in the long run it will not matter. The Bulls are a huge long-shot are not expected make it out of this second round with or without Rose. The Bulls will not go down without a fight and the Heat will feel it.